J-Hop Tour Journal: Sharing a cab to Shirakawago Light-up Event! Sharing a cab to Shirakawago Light-up Event! Shirakawago Light-up 2013 is available only on limited winter days! This event is held on following dates. The traditional atmosphere and snow covered thatched roof houses make this one of the popular winter locations in Japan. You will be enchanted by the illuminated village! 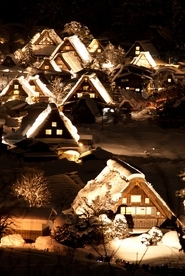 We organize a tour to the Shirakawago light-up event on Feb 2nd, 3rd and 9th! Date : February 2nd, 3rd, 9th and 16th! We added JAN 27th too!!!! ※The schedule will be changed due to traffic and weather condition. Please check the Cancellation policy before your booking. In case of cancellation, you might have to pay the cancellation fee according to the cancellation policy. Please call us or e-mail for the detail and your reservation!